It wasn’t so long ago that Mexico’s national league was heavy on brute force and power but light on the finesse style of play you see now. In the early 1990s, the teams in Liga MX favored hard kicks and strength over dexterity. 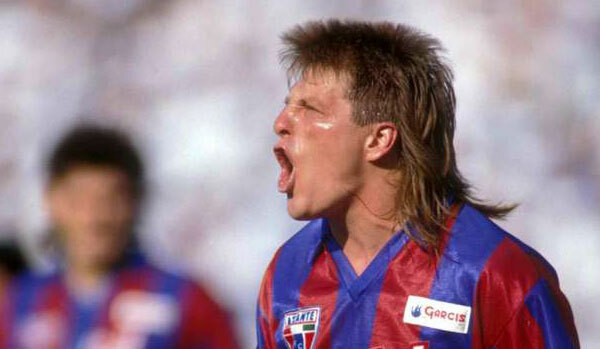 Those were the days of the mullets: Miguel “Piojo” Herrera, Efraín “Cuchillo” Herrera, Octavio “Picas” Becerril, José “Lupillo” Castañeda, Mario “Mudo” Juárez, Pedro Muñoz, José Luis Salgado and Marcelino Bernal were memorable mostly because of the brutality of their barbers. But those outrageous hairdos were more than just a terrible fashion choice. They were symbolic of how the team played on the field; rugged, individualistic, full of over-the-top flare and kitch. At that time, soccer was a reflection of early ’90s Mexico trying to rebuild itself from the devastating earthquake that shattered its capital in 1985. Punk music became popular among working class youth hit by the fragile economy and a hostile political climate. In the 1988 presidential elections, a “glitch” in the computerized vote counting system led to allegations of a massive fraud. Leftist candidate Cuauhtémoc Cárdenas lost to Carlos Salinas from the PRI party and the “perfect dictatorship” that had ruled Mexico for generations held onto power. “To understand this soccer generation of the ’90s, we have to understand that there was a lot of turmoil in the country, it was a time of frauds, a time of hustlers,” says Mexican sports writer Mauricio Mejía. Mexican soccer was also going through one of the darkest chapters in its history. FIFA banned all Mexican teams from international competitions in 1988 for two years after it found “cachirules”—over-age players—were sneaking into an Under-20 CONCACAF World Cup Qualifying tournament. After having hosted the 1986 World Cup, Mexico was banished from the 1990 World Cup in Italy. “The Mexican league begins the ’90s without any prestige, without any international reach; the first division was a sort of graduation from barrio leagues,” said Mejía. The players were rough around the edges. Many came from the slums and brought some of their street sensibilities, and their mullets, to the field. Efraín “Cuchillo” Herrera, another defender with a spectacular mullet, played alongside Becerril. “My best quality is that I knew what my limitations were,” Herrera said in an interview. “I lacked traditional skills. I was basically a piece of wood. But I knew that I could compete if I played at the very edge of the rules,” said Herrera in a telephone interview from Mexico City. “The Knife” said he sported his mullet as an act of rebellion against his military father and because he liked punk music. Of course alongside the mullets there were players—such as Benjamin Galindo, who had magical control and rarely lost the ball, and Cuauhtémoc Blanco who came out of the ghetto and was one of Mexico’s smartest soccer players—who shined even brighter due to the mediocrity of their compatriots on the field. 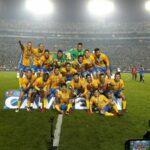 But overall, the reputation of Mexican league players was like that of the Mexican national team in that players were like “little green mice,” a term coined by journalist Manuel Seyde, because they seemed to run around the field aimlessly. The most humiliating defeat of this era was when Mexico lost the United States for the first time at the Gold Cup in 1991. Soon, though, everything started to change. It began with an Argentine invasion. Two coaches, César Luis Menotti and Marcelo Bielsa, came to coach in Mexico and began to transform the country’s game. Menotti, the manager that won the World Cup with Argentina in 1978, was hired in 1991 after the ridiculous defeat of the Mexican national team in Los Angeles. Along with his white-haired sideburns and his bohemian image, he brought with him a totally new school of thought. “What were we supposed to do? Manage teams that played badly, with dirty tricks, that betrayed the feelings of the people? No, of course not,” wrote Menotti in his memoir about his experience in Mexico. Javier Aguirre, a more contemporary Mexican coach who lived through the transition agreed that Menotti, “El Flaco,” came to symbolize the renewal of Mexican soccer. “With the arrival of Menotti there is a break with what was being done at the club level at that time. They begin to grow, investments were made to build up the infrastructure of youth squads, clubs start paying the managers of academies well,” said Aguirre. The players noticed the change. They began to realize they could aspire to a more aesthetic game and move away from brute force. “He changed our mentality. 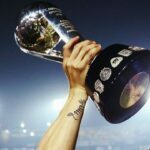 He was a World Cup champion manager, so we believed what he said,” said player Claudio Suárez of Menotti. “In my case, for example, he taught me concepts of the game, how to close in the defense, and who to pressure,” said Suarez, who is the most capped player in Mexican national team history with 177. But it wasn’t just Menotti who helped to change the culture. Dutch manager Leo Beenhakker began coaching America in 1994 and before another Argentinean, Marcelo Bielsa, arrived in Guadalajara in 1992 and founded the acclaimed Atlas youth academy. “El Loco” Bielsa implemented a system in Mexico that he first used during his time with Newell’s Old Boys of Argentina, according to a biography of the famous coach by Ariel Senosiain. He travelled the country looking for scouts that could find the most talented players in 92 small towns and send them to the club’s academy, polishing the rough diamonds from the country’s toughest barrios. Bielsa’s methods produced Pavel Pardo, Oswaldo Sánchez, Miguel Zépeda, Daniel Osorno, Juan Pablo Rodríguez, Jared Borgetti, and the best player in Mexico’s modern history, Rafael Márquez. It was this generation that left behind the tactics, and the mullets, of their predecessors. “The Knife” Herrera remembered one moment that perfectly captures this shift. At the Invierno tournament in 1998, playing for Pachuca, Herrera was ejected from the game after punching a fresh faced 19-year-old player from Atlas named Rafa Márquez. “It was a corner kick. Rafa and I were running to the first post looking for the ball. He pulls my shirt and we both fall on the ground and I lose my mind and start punching him. I think I only hit him twice. As I was running back to the locker room I realized that I could no longer play in the first division,” Herrera said. He retired then and there after 21 years in the first division. A graduate from the Mexican streets was unable to control his rage against a technically talented young man trained in soccer academies. Out with the old, in with the new. After Rafa, sophisticated players like Héctor Moreno, Andrés Guardado, Ricardo Osorio and Carlos Salcido went on to play in Europe. Now, there are 18 Mexican soccer players in European leagues. But maybe something is lost with all the precision and clean-cut looks of the new players, says “The Knife” Herrera.